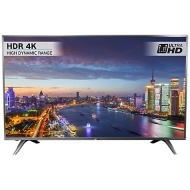 alaTest has collected and analyzed 181 reviews of Hisense H55N5700. The average rating for this product is 4.7/5, compared to an average rating of 4.3/5 for other products in the same category for all reviews. We analyzed user and expert ratings, product age and more factors. Compared to other products in the same category the Hisense H55N5700 is awarded an overall alaScore™ of 89/100 = Very good quality. I bought this tv a few weeks ago & it hasn't disappointed. I'm so pleased with it I'm going to buy another. This is my second Hisense TV now, loved the old one just ashame it only lasted 2yrs but hopefully this one will last longer and bring just as many hours of pleasure as before. Purchased 43" Hisense three weeks ago. Delighted with t.v. Excellent picture and the features are great. Purchased 1 month ago and would highly recommend this for excellent picture and sound. Only one minus, the legs are a pain, I would much prefer a swivel base for convenience of 'angle alteration' apart from that 5 star product.